In 1989, Bill McKibben published The End of Nature, the first book explaining global warming to a general audience. Even then, climatologists held consensus that it was unacceptably dangerous to flood the atmosphere with heat-trapping pollutants. In his latest book, McKibben describes his reaction at seeing The End of Nature become a bestseller: "I assumed, like most people, that reason would eventually prevail—that given the loud alarm sounded by scientists, governments would take care of the problem." The following 20 years taught him that power trumps reason. As findings from climatologists grew more dire, as freak disasters such as Hurricane Irene and Superstorm Sandy became more frequent, politicians continually failed to respond. It's been well documented why climate change is, in scientific terms, a nasty bugger of a problem. While humans react most effectively to threats with a face (say bears or Al Qaeda), climate change is a faceless enemy. Its effects are delayed and distant, striking first at the world's least powerful people (such as farmers in Bangladesh, Sudan, and Syria). And we can't say that climate change caused any particular storm, drought, or heat wave, even though we know it makes these events more frequent and severe. But the key reason climate change has eluded solutions is the enormous profitability of selling fossil fuels. ExxonMobil posted $44 billion in profit in 2012, more than any other American company. When Congress voted to approve the Keystone XL pipeline in 2012—a project that would link the carbon-intensive Canadian tar sands with global markets—it was quickly revealed that the "yes" votes had taken $42 million from the fossil fuel industry. That kind of money, McKibben concluded, would always outcompete scientific white papers for the attention of politicians. This became fully clear to him in 2009, when a decidedly modest climate bill failed in Congress, and international climate negotiations crashed in Copenhagen. The problem wasn't a lack of sensible policy ideas. It was a lack of power. 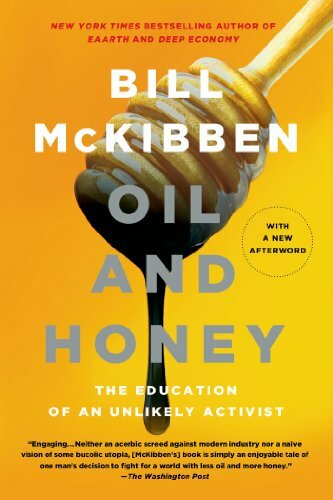 "Environmentalists clearly weren't going to outspend the fossil fuel industry, so we'd need to find other currencies," McKibben writes in his new book, Oil and Honey: The Education of an Unlikely Activist. "Instead of money, passion; instead of money, numbers; instead of money, creativity." Oil and Honey tracks McKibben's transformation from a writer at home in the New England backwoods to an international leader in the fight against climate change. The book also tracks the growth of 350.org, an organization founded by McKibben and a handful of Middlebury College students. Through imaginative strategies, 350 has muscled itself into a presidential campaign, influenced White House policy, and persuaded a lot of people who don't wear tie-dye to join climate action demonstrations. The bulk of Oil and Honey charts 350.org's work fighting the Keystone XL pipeline. A creature of the digital era, the group used the web to organize a worldwide day of demonstration in 2009, gathering images from thousands of simultaneous international demonstrations on its website. It inspired thousands to practice civil disobedience at the White House, forcing 1,253 arrests. Many of those arrested, including McKibben, spent nights in jail. Later, organizers surrounded the White House—either a house arrest for President Obama or an "O-shaped hug," as McKibben puts it. They held signs reminding the president of his lofty campaign promises on climate. On Capitol Hill, protestors wore referee shirts to "call foul" over dirty money in Congress. Despite the success of the pipeline delay, the group knew it needed to do more than fight Whac-A-Mole style, fending off projects from fossil fuel companies. So it launched a divestment campaign, prompting college students, civic groups, and churches to demand divestment from dirty energy companies. The key, says McKibben, is to shift from defense to offense against oil and coal companies: "We need to take away their social license, turn them into pariahs, and make it clear that they're to the planet's safety what the tobacco industry is to our individual health." Further, does support of one's cause (fighting the Keystone Pipeline) rationalize use of any and all means? McKibben tweeted his support of this group protesting the Keystone Pipeline who were on the front lawn of the home of an oil and gas corporate executive in full KKK mode: http://www.tarsandsblockade.org/enbridge-home-demo/ Would Jesus wear a mask, carry burning torches and threaten violence and/or endorse those who do? Jonathan Hiskes' review leads with the same type of discredited claims ("freak disasters such as Hurricane Irene and Superstorm Sandy became more frequent") as McKibben is famous for repeating. This review is rife with blatant errors. Ironically, those with any familiarity with Bill McKibben's public efforts can see the same pattern of factual errors and discredited claims. I am sure Bill McKibben has the best interests of our planet at heart. Sincerity is no excuse for repeating factual errors in defense of your cause. The fact that the earth has gone well beyond McKibben's "safe upper limit" for atmospheric CO2 concentrations of 350 ppm with no corresponding rise in global temperatures in 17 years should leave readers with questions about McKibben's climate change crusade. Hopefully, B and C will publish more reviews that approach their subject with at least an ounce of healthy, critical skepticism. Hiskes' article is more hagiography than review.